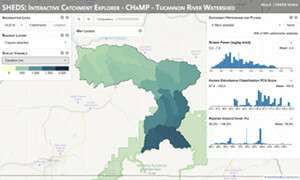 The Interactive Catchment Explorer (ICE) is a dynamic visualization interface for exploring catchment characteristics and environmental model predictions. 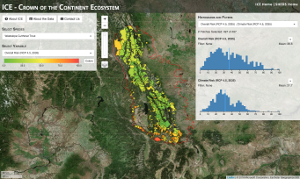 ICE was created for resource managers and researchers to explore complex, multivariate environmental datasets and model results, to identify spatial patterns related to ecological conditions, and to prioritize locations for restoration or further study. ICE is part of the Spatial Hydro-Ecological Decision System (SHEDS). Alternative versions of ICE have been created and customized to datasets and model results for the following projects. Management and restoration of hydro-ecological systems often relies on the use of large environmental datasets and model simulations. However, many of these datasets can be extremely large and difficult to process and understand using traditional methods. To increase the utility of these large environmental datasets and simulations, we need new ways of exploring the data so that we may ask questions and identify the trends and patterns needed to effectively manage and restore these valuable natural resources. 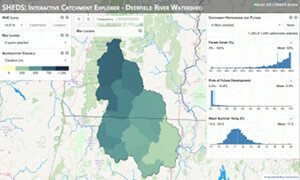 The Interactive Catchment Explorer is a data visualization tool that was developed to facilitate exploration of large environmental datasets representing various geospatial characteristics and model simulations. The purpose of ICE is to allow users with a range of scientific and management backgrounds to better understand the complex, multi-variate relationships of environmental systems through an intuitive map-based interface at multiple spatial scales. ICE was originally developed to present the results from stream temperature and brook trout occupancy models of the northeastern U.S. that were developed by our research group at the USGS Conte Anadromous Fish Branch. From the beginning, however, ICE was intended to become a general platform that could be easily adapted for other environmental datasets and models. It has since been used to help other research groups across the country focus on their own datasets and model results in order to better understand the patterns and trends of their target systems. ICE is developed by Jeffrey D. Walker, PhD and Ben Letcher, PhD through the USGS Conte Anadromous Fish Lab and UMass Amherst Dept. of Environmental Conservation. Modeling and database support was provided by Dan Hocking, PhD and Kyle O'Neil. Additional web development support was provided by Chris Jennison. ICE is funded by the NE Climate Science Center, North Atlantic Landscape Conservation Cooperative, USGS and DOI Hurricane Sandy Restoration funds, and the USGS National Climate Science Center.